When Coro and her partner, Phillip Legg, built their new home, they wanted to make it as energy efficient and environmentally friendly as possible. 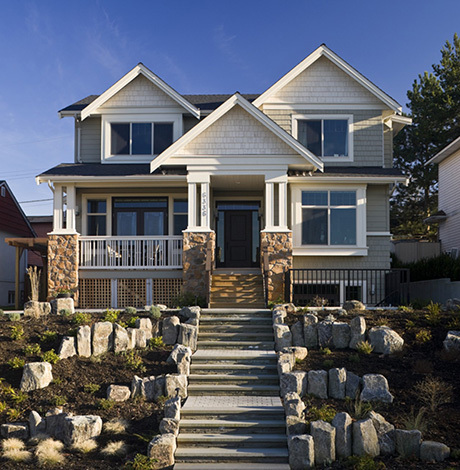 Following a steep learning curve, myriad decisions and 11 months of planning and construction, the Strandberg-Legg house became the second residential home in British Columbia to achieve LEED Gold status under the LEED for Homes rating system. The home also received an environmental award from the City of Burnaby in the planning and development category for its demonstration of innovative environmental features. The Leadership in Energy and Environmental Design (LEED) Green Building Rating SystemTM encourages and accelerates global adoption of sustainable green building and development practices through the creation and implementation of universally understood and accepted tools and performance criteria. An internationally accepted benchmark for the design, construction and operation of high performance green buildings, it is a third-party certification program that gives building owners the tools they need to have an immediate and measurable impact on their buildings’ performance. LEED Canada for Homes is a rating system that promotes the design and construction of high-performance green homes. A green home uses less energy, water and natural resources; creates less waste; and is healthier and more comfortable for the occupants. Certification is based on the total point score achieved, following an independent review and an audit of selected Credits. There are four levels of certification: certified, silver, gold and platinum. View architectural photos of the home. Check out the Strandberg-Legg home’s green features. Every vanguard movement needs leaders who will break new ground, push boundaries, take risks and share knowledge and success. Coro and Phillip did this with the 2010 Green Building Challenge and their beautiful LEED Gold home. Not only do they set a fine example, but they actively promote the benefits of being green.